When I started Connected by a Thread, it was because I had multiple designers tell me that I should not be working for free. I have been providing most of these services for free for over 3 years! Having worked with multiple designers, I chose to develop this business by taking the stress off the designer for some of the tasks that keep them away from the designing side of their art. Pattern Proofing- When you (or your trusted testers) are reading your pattern, it is easy to miss things as you know what it is suppose to say. I have a different way of reading the patterns that helps me to catch things you would normally miss. 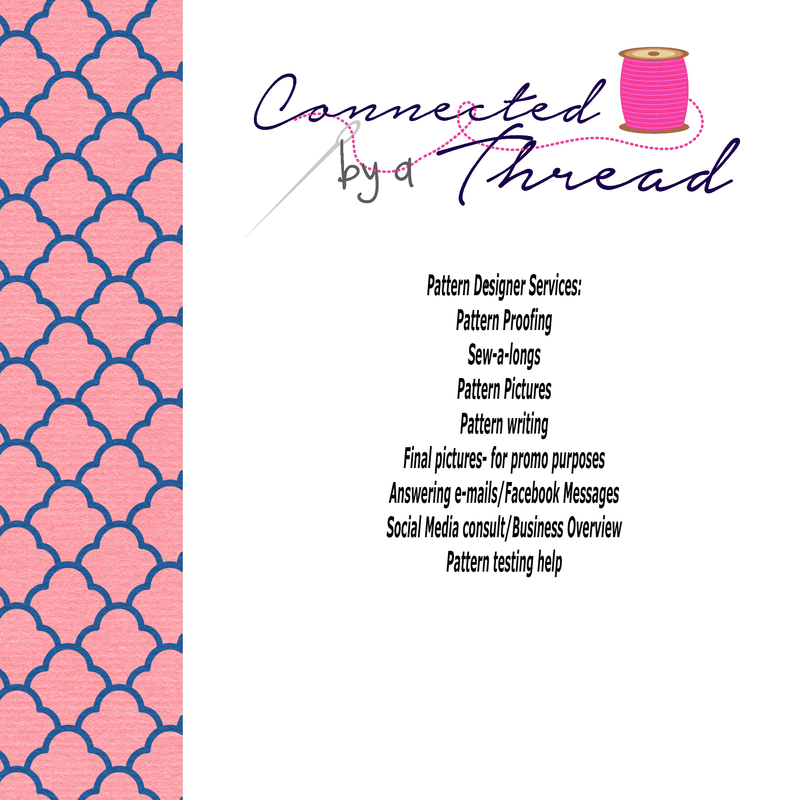 Sew-a-Longs & Blog tours- Anyone that has been in the PDF world knows that these take up a lot of time! They take a lot of planning, then a lot of social media time to advertise/post each day and to answer questions of the daily steps. Let me take that stress away! Pattern pictures/Pattern writing: For some designers, this is the hardest part. I can provide a simple set of directions that you can then tweak to fit your style. I can also take your pattern and take the step by step pictures for you. Final Pictures- Do you have the pattern finished and just need some extra pictures for promotions? I sew for myself, my children (a teen and a toddler), and also have access to kids of other ages. I am not a professional photographer, but have improved my skills over the last year with the upgrade of my camera. Answering e-mails/Facebook messages- This was a special request from a designer. Sometimes you need to be concentrating of other aspects of your business and the messeges/emails for help get pushed aside. Social Media consult/overview- We all know how important social media is to a business these days. Let me help you succeed! I will look at all areas that you are currently using and provide feedback on improving your presence. I will offer suggestions on how to get your name out there, and the correct avenues to use. Have something you need help with but don’t see it above? Just ask! If you would like more information, please feel free to contact me!